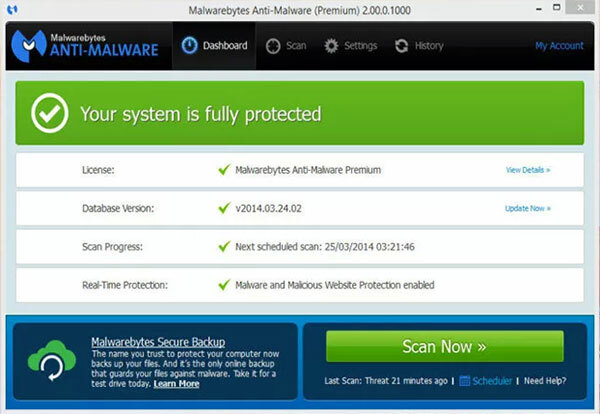 Malwarebytes is a high quality anti-malware application that promises to protect the users from malware attacks. We are of the opinion that you will find this software easy to use and will experience no problems when you wish to personalize it. Furthermore, after we analyzed it we can safely say that is a noteworthy anti-malware application. The users who decide to download this security tool will be presented with the latest version named Malwarebytes Anti-Malware 2.0 that was created only in March 24th, 2014. The creators recommend to choose PREMIUM version which allows the users to protect three computers at the same time. The developers of this software guarantee that this version will let you to schedule scans and database updates by yourself, provide you with faster scanners, and, of course, will ensure that your PC is protected in real-time. You will also find a new interface (UI). This free version of Malwarebytes is available in a lot of languages which means that even if the users are not entirely comfortable with the English language, it is possible that they will be able to use this security tool in their mother tongue. Another pleasant surprise is the help which you will get, if you need to remove some malware manually. The extra utilities presented for such cases will definitely be useful someday. Also, our already mentioned scans differ from other scans by the speed an efficiency, though it does not seem to have any outward affect on CPU. Most importantly, this anti-malware can be run alongside another similar tools which allows the user to increase the possibility that any malware will be caught even quicker. The latest version presented by the creators comes to the users with the ability to detect and eliminate any spyware that resides in your archives faster. The users also will have an opportunity to ignore the threat for a while or to appoint it to the Ignore List where it will be safe. This feature is especially useful when anti-malware detects some harmless application. For the future, the creators promise to enrich the Tools of this application even more. To sum up, Malwarebytes seems like a trustworthy and powerful anti-malware which deserves the right to stand next to the most popular products of this market. Thanks to the latest technologies used when creating this software, malicious programs cannot block Malwarebytes scanners or stop it from removing the intruder. Real-time protection is another very important feature which ensures that your PC is safe twenty-four seven. The only defect we noticed in this tool was that it provides real time protection only in its PREMIUM version.